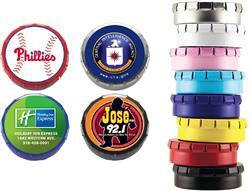 Our Custom Lip Balm Tins with promotional full color logo or direct imprint. All natural Beeswax formula U.S. made premium Lip Balm in snap top tin. 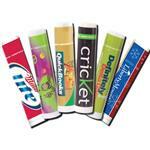 Comes in a variety of tin colors with a 4-color process label and tamper evident wrapper. Flavors: Banana, blueberry, bubblegum, cherry, chocolate, coconut, cotton candy, lemon, orange, pineapple, pomegranate, spearmint, strawberry, tropical punch, watermelon, pina colada, strawberry daquari, blue hawaiian, fuzzy navel, pink lemonade, cherry vanilla, carmel latte, strawberry banana - adding more flavors weekly! RUSH AVAILABLE!